Custom built - tailored to the customer's needs. For both types of servers, for every quotation, we try to gather as much information on the requirements as possible (how many users, used applications, etc.). Backup: In some cases, tapes are the way to go. In other cases, it's better to use external hard disks. Redundancy: Try to use RAID mirror drives. If budget allows use redundant power supplies. In some occasions, a duplicate server is the most reliable solution. Extended warranty. 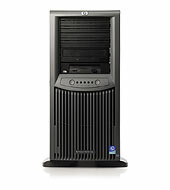 Up to 3 years on-site, available for both the custom built or the brand name servers. Please always call for a personalised quotation.